In 2011 I visited the Southern region of Spain, Andalucia. Knowing about my Spanish heritage and the influence it always had in my parent’s lives, from popular songs to ancient food recipes that passed from generation to generation, I knew I needed to see what was all about. Why I kept having this feeling in my chest every time I heard a guitar playing in the background? 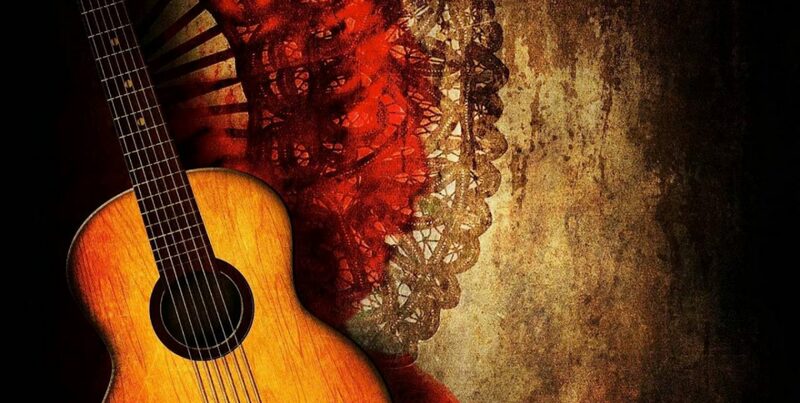 All of my uncles from my mother’s side were guitar players, and my mother’s deep memorization of Spanish influence songs and poems keep coming to mind as I am still in awe of her cool knowledge and love for the “motherland” as they said back home. When I got to Seville, I discovered my passion was flamenco. Watching a live show brought in a feeling that today I still cannot explain. The guitar sounded deep, and the voice of the singer brought goosebumps to my skin. Tears fell down as my emotions played a trick on me. Flamenco became my thing and since then, I promised myself that my next travel to Seville would have to be to the Seville Fair, where I would love to dance a Sevillana. (Sevillana is a style of flamenco that is very typical of Spanish culture). Flamenco Dance Site blog provides an opportunity for the reader to learn about the roots of flamenco, the experience of this one student in her process of learning, and some tips on tools and links to flamenco schools for the new learner. Additionally, we will learn about different flamenco artists, where to watch an authentic flamenco show in Spain and little interviews or excerpts of flamenco dancers. Ninotchka Devorah Bennahum in the Encyclopedia Brittanica defines flamenco as a form of song, dance, and instrumental (mostly guitar) music commonly associated with the Andalusian Roma (Gypsies) of southern Spain. (the Roma people are called Gitanos.) The roots of flamenco, though somewhat mysterious, seem to lie in the Roma migration from Rajasthan (in northwest India) to Spain between the 9th and 14th centuries. These migrants brought with them musical instruments, such as tambourines, bells, and wooden castanets, and an extensive repertoire of songs and dances. Sephardic Jews in Spain left a strong influence in architecture, philosophy, education, health, music, and arts. In Spain, they encountered the rich cultures of the Sephardic Jews and the Moors. Their centuries-long cultural intermingling produced the unique art form known as flamenco. The roots of flamenco are not precisely known, but it is generally acknowledged that flamenco grew out of the unique interplay of native Andalusian, Islamic, Sephardic, and Gypsy cultures that existed in Andalusia prior to and after the Reconquista. Andalucia is the Southern part of Spain. The territory is divided into eight provinces: Almería, Cádiz, Córdoba, Granada, Huelva, Jaén, Málaga, and Seville. Its capital is the city of Seville (Spanish: Sevilla). The word Andalucia comes from Al-Andalus, the term used by Muslim Spain or Islamic Iberia, which was a medieval Muslim territory and cultural domain occupying at its peak most of what are today Spain and Portugal. The Umayyad conquest of Hispania or Spain, was the initial expansion of the Umayyad Caliphate over Hispania, largely extending from 711 to 788. The conquest resulted in the destruction of the Visigothic Kingdom and the establishment of the independent Emirate of Cordova under Abd ar-Rahman I, who completed the unification of Muslim-ruled Iberia, or al-Andalus (756–788). The conquest marks the westernmost expansion of both the Umayyad Caliphate and Muslim rule into Europe. The Islamic culture has left a strong influence in flamenco. If you have any questions about flamenco and its roots, leave a comment below and subscribe to our blog, we are glad to keep you informed.